When I was growing up and first started reading books (as opposed to picture books), The Boxcar Children were a real staple in my reading diet, so I was pleased to see that their adventures continue in this updated series. The Alden children (Henry, Jessie, Violet, and Benny) are now globe-hopping with the family dog, Watch. After being introduced to a secret society that returns lost and stolen artifacts to museums and historic sites, The Boxcar Children join in the world-wide search for missing artifacts. But as if working with ancient treasures weren’t already enough of an adventure, when the Aldens arrive in Cairo, the agent that they were supposed to meet has gone missing. While the Aldens are working for the secret society, they don’t know what artifact they are transporting or anything else about their ‘mission’ until they arrive at a destination and decode a clue. The clue here is on a papyrus scroll (hence the title), but it takes time to even get to that point as the agent is missing. Once they figure out what they have and where it’s going, the Alden siblings still have to evade a thief who is following them. These are definitely not the Boxcar Children I grew up with. These children are now world-travelers (on their own!) and much more savvy than those I read about back in the 1960’s and certainly not even close to those from the 1920’s! There were plenty of adventures close to home for the early Aldens, but now they travel with ease around the globe. I’m sure there’s more of an educational value to this, teaching children about places like the pyramids of Egypt or Stonehenge, but it takes away from the innocence of the Boxcar Children. That’s what I miss the most … innocence. These children, with their laptop computers and they ‘Facetime’ don’t really resemble their namesakes of old. I know this is the world we live in, but it just doesn’t ‘feel’ right with these particular children. But these books aren’t written for me. They are written for an audience that already takes smart phones and laptops to school (yes…I know elementary school children that have laptops in school). These books are for children who already have access to Magic Tree House stories and Magic School Bus stories, where the past is approachable, as is outer space. To compete for attention, the Aldens must step up their game, and I think that the new Boxcar Children (still using the Gertrude Chandler Warner name as author) do this well. It’s just a little sigh-inducing for some of us. Looking for a good book? 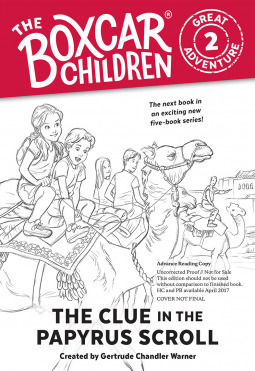 The Clue in the Papyrus Scroll is a new Boxcar Children book by Gertrude Chandler Warner and brings the exploring siblings in to the modern world and has them traveling all around the globe.